Calves are mainly about two muscles which need to be worked upon regularly so that they are well built, flexible and toned too. Irony is that these muscles are the most difficult to strengthen or build, which is why weights are primarily used. However, everyone might not be comfortable with weights or weights might not be available too, when you choose to workout during your holidays or from home. There are specific calf exercises which can be done without weights, which are equally effective and help in the growth and strengthening of the muscles. These exercises are usually easy and can be done by beginners too. Whenever we use a jump rope to workout, our calf muscles are continuously engaged. This helps in building muscle strength and improves circulation. To do the workout, you need to hold your hand by your sides. Then make fast but small circles with the help of your wrists, just as you would spin a rope. You will be jumping an inch above the ground, just above the rope, as the rope passes under the feet. You need to jump rope at least thrice a week. You can do the first set for two minutes and then as you get comfortable you can do more sets. Try to do each session of 15 minutes at least. This helps in building flexibility, agility and strengthens the vital calf muscles. Start by keeping your feet together. Your arms shall be by the sides. Now, take a step forward and get into a lunge position, using your right foot. You can bend your right leg and make a 90-degree angle using your knee. You can then bend your knee. At this position, you should pulse up which will straighten your left leg. You need to bend so that you can complete a pulse. You need to slowly pulse up and then down, at least 15 times on every side. This will help in developing the soleus muscle, which helps in your overall fitness and endurance. This is another simple workout which can be done by beginners too. It is less risky and chances of injuries are reduces. You need a bench or any sturdy object for the exercise. You simply need to bend a bit and grasp this stable object. You can also bench using your hands. Your toes shall be facing a bit forward. You shouldn’t be locking the knees at this point. Your partner can then slowly climb on the lower back. You shouldn’t feel a bad pressure or you might injure yourself. However, the heavier the weight is, better it shall be. You can then lift your heels from the floor by gently pushing up the balls of your feet. Wait for some time and then lower to the ground. You can repeat 6-8 times as you start and then increase the repetitions as per your comfort level. You need to start this workout in a pushup position. Slowly bend your right knee and then bring the left foot just between the hands. Keep your foot on the ground. Your hands shall be in a push-up position. You need to jump and switch your legs, as you slowly straighten the right leg out and position it just behind you. You can bring the left leg up just between the knees. You should repeat as quickly as possible in a minute. 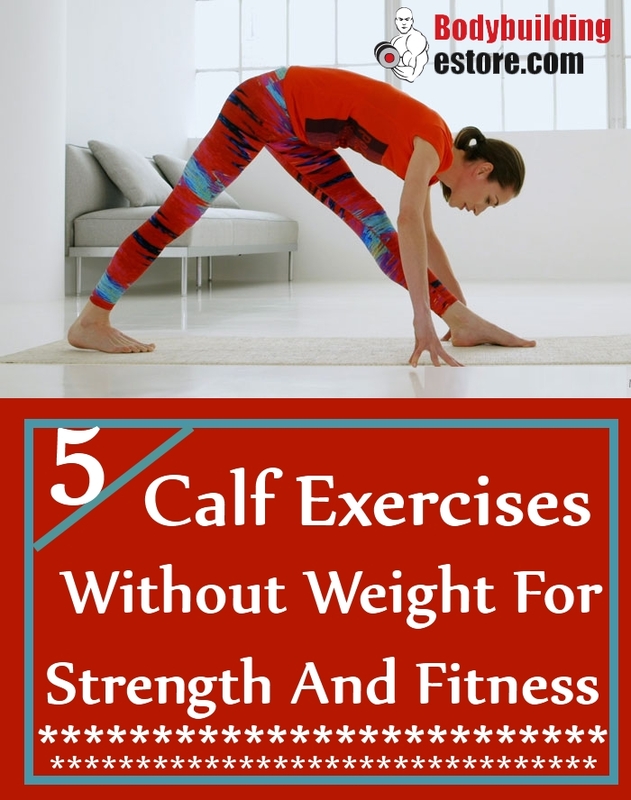 This is an excellent exercise which helps to strengthen the calf muscles. The explosive jump like movement helps in strengthening the calf muscles and builds flexibility. This is an excellent exercise which helps in toning as well as strengthening the calves. It uses your own body weight and helps in building muscle mass and good strength. To do this exercise, you need to stand comfortably near a wall and keep yourself balanced. Your feet shall be hip distance apart. Your hips and knees shall be vertically aligned. Now, you need to slowly push your body a bit upwards on your both feet. Your abdominal muscles will be engaged, and your back is kept straight. Do not move your back forward or backward. If you wish to make the workout intense, you can also place the balls of your feet on a step. Thus, your heels shall be at a lower level. You can push up your feet and lift your heels as much as you can take your feet up. You can again lower the heels and get back on the floor. Repeat.